Teeth with endodontic treatment can last as long as natural teeth as long as you brush and floss daily, have routine check-ups and eat a healthy diet. However, if a tooth that has undergone root canal therapy and does not heal, or even if treatment is successful, sometimes pain resumes, and the tooth becomes diseased. Under these circumstances, root canal retreatment or also called endodontic retreatment may save your tooth. 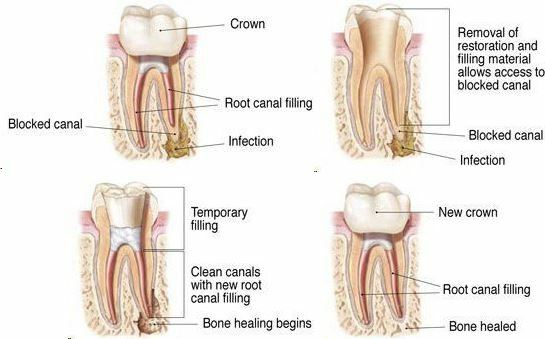 During endodontic retreatment, the root canals are reopened, filled and sealed again. This procedure is done in house by root canal specialist also known as Endodontist. Usually the crown and other materials must be removed for the dentist to access to the canals. The inside of the tooth is carefully examined for the presence of other canals and unusual anatomy to ensure a thorough cleaning and sealing during this retreatment. Endodontic surgery or surgery along with retreatment may be recommended. Tooth extraction is the only other alternative and followed by Dental Implant. This process is ultimately more expensive and time consuming because the tooth must be replaced. While modern tooth replacements are effective, nothing is better than your natural tooth. If you are experiencing problems with a previously treated tooth, you may need root canal retreatment. Call 201.662.1922 to schedule your appointment now!